House 4929 in the town of Pomena, Mljet - South Dalmatia has accommodation units of type Room (2) and is 30 m away from the sea. The nearest beach to this accommodation is a rocky beach beach. 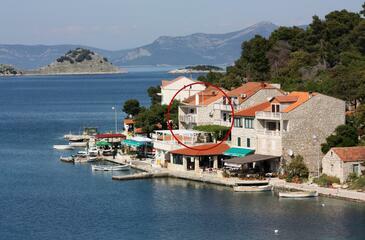 The house is divided into several apartments, where other guests will be staying during your holiday. Your hosts will be staying in the house during your stay. In the house is free Internet access possible. This house also includes a yard of 50 m2. Shop can be reached by a walk. More than a kilometer away you will find: Urgent medical care. The property cannot be reached by car. The parking lot is more than 100 meters away from the facility. Restaurant is located in the facility. Since the property is located within the area of Mljet National Park, guests must buy tickets for the national park in order to reach the property. Room can accommodate 2 guests. 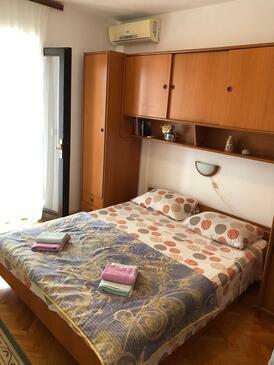 Beds are situated in 1 sleeping rooms, within 16m2. Guests can enjoy a sea view from the private terrace. Reserved accommodation unit is a room with its own bathroom and there is no usage of kitchen. Some of the rooms of the accommodation unit are not connected with the rest of the unit.